BANGUI: Heavily armed African and French peacekeepers escorted some of the last remaining Muslims out of Central African Republic’s volatile capital on Sunday, trucking more than 1,300 people who for months had been trapped in their neighbourhood by violent Christian militants. Within minutes of the convoy’s departure, an angry swarm of neighbours descended upon the mosque in a scene of total anarchy. Tools in hand, they swiftly dismantled and stole the loudspeaker once used for the call to prayer and soon stripped the house of worship of even its ceiling fan blades. One man quickly scrawled “Youth Centre” in black marker across the front of the mosque. Others mockingly swept the dirt from the ground in front of the building with brooms and shouted “We have cleaned Central African Republic of the Muslims!” “We didn’t want the Muslims here and we don’t want their mosque here anymore either,” said Guy Richard, 36, who loads baggage onto trucks for a living, as he and his friends made off with pieces of the mosque. Armed Congolese peacekeepers stood watch but did not fire into the air or attempt to stop the looting. 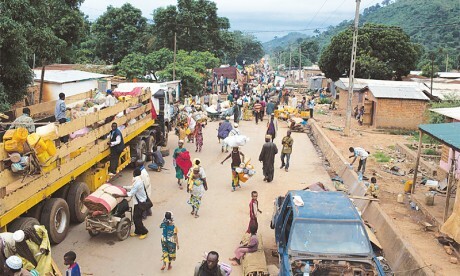 Soon teams of thieves were stripping the metal roofs of nearby abandoned Muslim businesses in the PK12 neighborhood of Bangui. “Pillage! Pillage!” children cried as they helped cart away wood and metal. “The Central Africans have gone crazy, pillaging a holy place,” said Congolese peacekeeper Staff Sgt. Pety-Pety, who refused to give his first name, as the mosque came under attack from militants known as anti-Balaka in their trademark wigs and hats with animal horns. Sunday’s exodus further partitions the country, a process that has been under way since January, when a Muslim rebel government gave up power nearly a year after overthrowing the president of a decade.